KAKKMADDAFAKKA are somewhat of an anomaly in today&apos;s music scene. Their sound is almost impossible to categorise, containing elements from almost all the musical movements of the past century. But what else would expect from the latest band to emerge from the innovative Bergen music scene that produced Kings Of Convenience, Datarock, Royksopp and Casiokids. 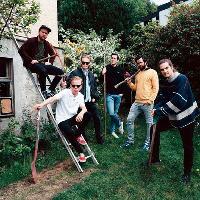 KAKKMADDAFAKKA have been thrilling crowds up and down Norway since 2004 with their on-stage party, which features up to ten persons, including a horn section and dancing choirboys. The band is now building a solid reputation overseas after shows around Europe, the US and Canada, including festival appearances at CMJ Music Mararthon, Euro Sonic, NXNE, Melt!, Montreux Jazz Festival and soon Lowlands! On 25 February 2011, Kakkmaddafakka released their second album Hest. The album was produced by Erlend Ã˜ye and released on the label Bubbles. The first single taken from the album was "Restless". Do you promote/manage KAKKMADDAFAKKA? Login to our free Promotion Centre to update these details.